Christie® was the solution Clark, a leading audio, video and lighting provider specializing in houses of worship, selected for Preston Trail Community Church in Frisco, Texas. Renowned for their exceptional reliability and brightness, six Christie 3DLP® projectors including the Christie Roadie HD+30K and the Roadster HD20K-J, light up the church’s interconnected worship spaces with crystal-clear images for a more robust service. The worship center includes the 1,800-seat auditorium featuring a two side screens framing a center screen, a 500-seat youth center, and two smaller spaces for younger children. 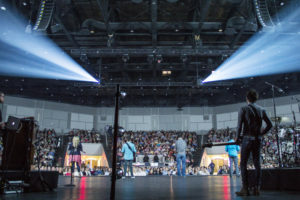 Since its beginning as a mobile ministry in 2004, Preston Trail’s unique presentational style of communicating the message has consistently resonated with the faithful and helped grow the congregation to over 3,000 worshipers. When its pastors decided to establish a permanent worship venue, they moved from an old manufacturing facility into a new, ground-up constructed building. Collaborating with Clark early in the facility’s construction, Preston Trail created an infrastructure upon which Clark could integrate top-of-the-line audio, video and lighting technology that would meet its current and future needs.